View of “Denise Green,” 2010. 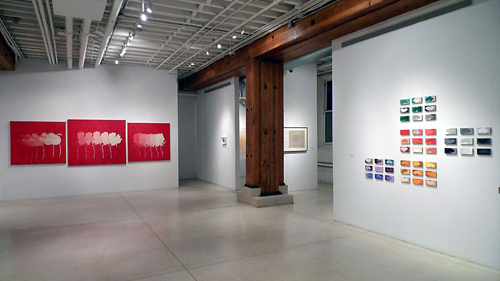 From left: A Rose Is a Rose (Marvin), 2005; “Beyond Richter,” 2009. The paintings in Denise Green’s latest exhibition, “Wonder and Evanescence,” are florally themed but not flowery––they are serious latter-day abstractions. This is unsurprising given that the New York veteran trained at Hunter College some forty years ago with Mark Rothko and Robert Motherwell. The influence of her teachers shines through in Green’s vibrant color fields and explorations of heavy raw canvas. But Green’s concern in work such as A Line Is Never Just a Line (For John Stringer), 2009, and A Rose Is a Rose (Ralph), 2006, is less with the formal progression of the medium than with extrapolations of the embedded spirituality in earlier Abstract Expressionism, in this case by way of the concept of “metonymy” posited by Aboriginal cultures of her native Australia. That is, the fusion of the ineffably personal and the concretely immanent. While her canvases bear the familiar hallmarks of earlier modernist practices, they are tempered by a deft use of ground pigments, dust, pencil sketching, and staining. Otherwise-stentorian monochromes are thus made diaphanous, grid lines and zips rendered apparitional. This subtle transmutation of earlier vocabularies is predominantly manifest in “Beyond Richter,” a chromatically arranged series of arced silk-screened reliefs that reference Gerhard Richter’s color charts of 1966–2007. While Richter’s implacable grids are meant to invoke and negate modernist claims and declare the autonomy of color, Green’s reimagining breaks apart the harsh, linear seriality of the original. Instead, we are presented with semiprecious objects, not quite painting or installation, that are richly hued and delicately balanced. Green’s modulation of painterly means and organic form here proves that abstract painting is still fertile ground for investigations both intimate and formal.